and lover is brought back to life in a musical with a soaring and lavish score by Lyndon Samuel ( &apos;Ghost Story&apos;) and book and lyrics by Robert Gould (&apos;My Land&apos;s Shore&apos;). 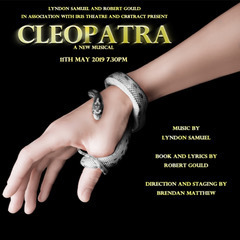 &apos;Cleopatra&apos; The Musical focuses on Cleopatra&apos;s conflict between her desire for power and her need to be loved, the dramatic war-torn politics of the times and the tragedy of the two men (Julius Caesar and Mark Antony) doomed by their love for her. This intimate concert performance of the show directed by Brendan Matthew (&apos;My Land&apos;s Shore, &apos;The Hired Man&apos;, &apos;The Kissing Dance&apos;) will be an opportunity for an audience to see and hear a brand new musical in development.